W.Bro. 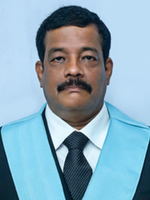 Rajagopal was born on 14th July 1959 and was initiatied into Freemasonry on 18th April 2009. Rajagopal is the Chief Executive Officer of Anand Niketan - a full service contracting company offering professional build and design services as well as real estate buying and selling, rentals, and property management services. Rajagopal is married to Savitha, and they are blessed with a son and a daughter. Rajagopal served nine years as Finance Head of the 600 crores A.T.E.Group of Companies and 10 years as Director & COO of Great India Estates Pvt. Ltd., a CREDAI Trivandrum founding member, Treasurer, General Convener – Credai- TVM Property show. He has initiated and completed over half a million square feet of premier real estate space.